I'm trying to re-call as much as I can and it's difficult remembering 'Billy the Cat and Katie' in the comic book 'The Beano' or was it 'The Dandy'. Here's what I've found that might help. Not to be confused with Bill the Cat or Billy the Cat. Billy the Cat (later Billy the Cat and Katie) was a comic strip in The Beano. The strip featured William Grange, later joined by his cousin Kathleen, alias Billy the Cat and Katie. Both were acrobatic crime fighters who helped the police to solve crime and catch "crooks" in the town of Burnham, and they wore "cat-suits" in order to conceal their true identities. The original version of the strip was drawn by David Sutherland, and ran in distinct series from issue 1289 (dated 1 April 1967) to 1677 (7 September 1974). When the strip made the final appearance of its original run in 1974, it was one of the last remaining adventure strips in the Beano. An older version of Billy, without Katie, and now set in Marham, appeared in Buddy comic in the 1980s. Minus Katie, the strip returned to The Beano for six weeks from issue 3195, dated 11 October 2003, drawn by Wayne Thompson and Richard Elson. In 2005, it made a second brief return, scripted by Mike Chinn and this time drawn by Nigel Dobbyn, who has also subsequently drawn several Billy and Katie stories for Beano Annuals, from the 2007 annual onwards. The story in that annual was written by Bash Street Adventures artist/writer Kev F Sutherland. The 2009 annual did not have a Billy the Cat story, though he reappeared in the 2010 annual, starring "William the cat" in a Victorian setting which turns out to be the hallucination of an unconscious William Grange, on a school trip to a museum. He made a guest appearance in the 70th anniversary Beano in 2008, this time drawn in a Manga-like style by Laura Howell. 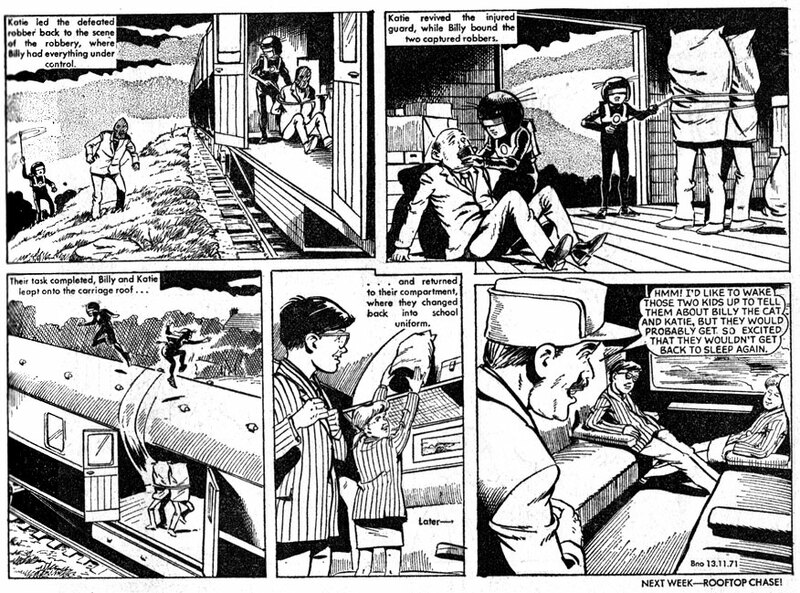 Billy returned to the comic shortly after in issue 3554 (dated 18 October 2008), as a single-page strip illustrated by Barrie Appleby. This was the strip's eighth series in the comic. However, it was removed from the comic the following year because it was not popular enough. This was said to be because readers felt the story needed more pages, or that the stories weren't exciting or adventurous enough. On the Beano website a humorous video was put up showing what 'happened' to Billy the Cat, illustrating Billy jumping onto a building, then out of nowhere, he's crushed by 10 tonnes. Despite ths, Nigel Dobbyn's version of the strip appeared in the Beano Annual 2011 . However, Dobbyn was unhappy with how his artwork had been stretched in that year's annual, and as a result Billy did not appear in the 2012 annual. This was a crossover between Billy the Cat and General Jumbo in the 2008 Beano Annual written by Kev F Sutherland and drawn by Nigel Dobbyn. It involved Jumbo's radio control having been modified by a sentient model infantryman, taking control of Jumbo's actions. 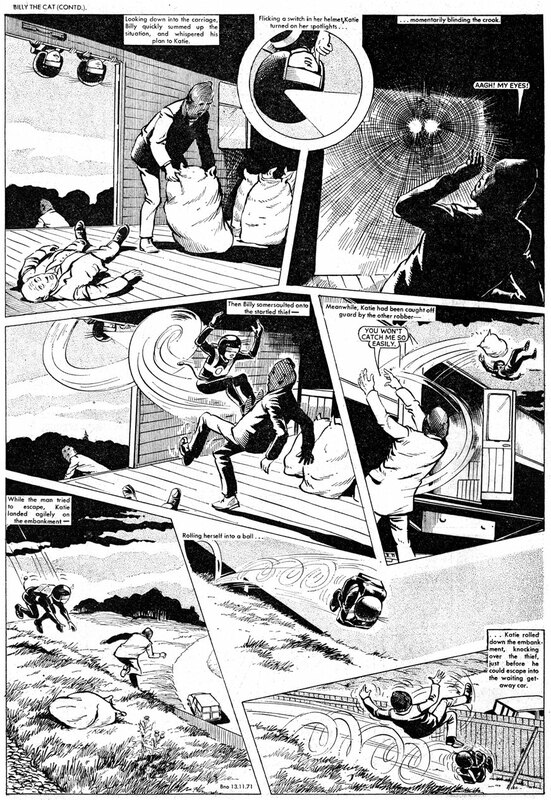 Billy had to save the day, firstly by removing Jumbo's wrist-controller and secondly by causing it to feed back on its creator - who, however, in homage to a classic B-movie motif, shows faint signs of life in the final panel while the heroes make their exit. (There is further homage in the naming of some of the model infantrymen, although using "Sergeant-Major" as "Wilson"'s rank is a departure from the strictly parallel.) This story was concluded in the 2009 annual, but this time only featured Jumbo and was drawn by another artist. The Beano is a British children's comic, published by D.C. Thomson & Co and is arguably their most successful. The comic first appeared on 30 July 1938, and was published weekly. During World War II, The Beano and The Dandy were published on alternating weeks because of paper and ink rationing. D. C. Thomson's other publications also suffered, with the Oor Wullie and The Broons annuals falling victim to paper and ink shortages. Paper and ink supplies were fully restored shortly after the end of hostilities and weekly publication of The Beano and The Dandy resumed in 1949. In September 2009, the Beano's 3,500th issue was published. The Beano is currently edited by Michael Stirling. Its iconic characters such as Dennis the Menace, Roger the Dodger, Minnie the Minx, The Bash Street Kids, Calamity James, Ball Boy, Ivy the Terrible and Billy Whizz have become known to generations of British children. Earlier generations will remember other notable characters who have been phased out, such as Biffo the Bear and Lord Snooty. Some old characters, like The Three Bears and Little Plum, have made a return. The comics were also distributed in some of Britain's colonies or former colonies. As they were sent by sea mail, they would go on sale some weeks after the date shown on the cover. A number of strips in the comic have run for a very long time. The top five longest running Beano comic strips are, in descending order, Dennis the Menace, Minnie the Minx, Bash Street Kids, Roger the Dodger, then the last holder of the title before Dennis, Lord Snooty. Dennis the Menace's famous 'red and black' jersey had formed the colours of a few of the Beano characters' clothes (Minnie the Minx has the same, although the placement of the stripes is a bit different; Ball Boy's was a vertical red and black; Roger the Dodger has a chessboard design top, and Danny (from the Bash Street Kids) has a similar cap), but they have changed for Minnie and Ball Boy (Minnie at one point had a red and yellow top and Ball Boy's strip is now black and blue). There are frequent fictional crossovers between Beano characters, with most of the characters living in the fictional Beanotown. Many of the comic strips in The Dandy are drawn by the same artists, and crossovers between the two comics also occur occasionally. Quite often, one comic will make a tongue-in-cheek jibe at the other (e.g., a character meeting an elderly lady, and stating that she's "older than the jokes in The Dandy"). In the strips, it is expressed that the two towns are rivals with each other and before The Dandy did a drastic format change they had an embassy in Beanotown which many of the town's citizens attempted to overrun, but failed (the embassy had no existence in The Beano). This rivalry inspired the spin-off computer game Beanotown Racing, in which various characters from both comics could be raced around points in Beanotown, including the Embassy. The game was given a large amount of advance publicity in the comics, with story lines often revolving how the characters each acquired his/her vehicle. Occasionally there are longer than usual strips for example a strip of sixteen pages rather than the usual two pages. These longer strips include The Bash Street Kids Adventures written and drawn by Kev F Sutherland which since 2004 have featured parodies of famous comic strip images, including Amazing Fantasy's first Spider-Man cover, Action Comics' first Superman cover, and most recently the cover of X Men #100. During the 1980s, The Beano ran a 'Readers' Request' feature where readers could request for a particular comic strip to feature in the Beano. This led to the return of dropped characters, including Little Plum, Baby Face Finlayson and The McTickles, but also led to the introduction of new strips such as Little Monkey. Reader polls started to appear in the 1990s, allowing the readers to rate the strips in the comic. These polls have been quite influential, as they indicate which strips the readers like best, and strips that have performed poorly in these polls were usually dropped. On a number of occasions the Beano has allowed its readers to vote for which new strips they want to appear in the comic. This usually consists of three new comic strips being run for a number of weeks and the readers can vote on which strips they prefer and the one that receives the most votes stays in the Beano. Readers have been able to cast their votes via telephone, or more recently via the Beano website. The first such vote occurred in 1995 with Vic Volcano emerging as the winner. In the 1997 competition, two new strips were added permanently, with Tim Traveller winning and Crazy for Daisy the runner-up. By the early 2000s, these competitions were named Comic Idol (in reference to Pop Idol. In the 2004 competition, the margin between winner Joe Jitsu and runner-up Colin the Vet was 1%, so both strips were added to the comic. The most recent incarnation in 2010 featured three new strips, Meebo and Zuky, Home Invasion, and Uh oh Si Co!. Meebo and Zuky won, with Home Invasion finishing as runner-up, though only Meebo and Zuky were added to the comic. In 2011 the Dandy did a similar competition where readers voted for their favourite out of four strips, entitled Strictly Come Laughing (a reference to Strictly Come Dancing). In 1921, D. C. Thomson had first entered the field of boys' story papers with Adventure. The success of this paper led to five further publications, The Rover and The Wizard in 1922, The Vanguard in 1924, The Skipper in 1930 and The Hotspur in 1933. Although The Vanguard folded in 1926, the others were a great triumph and became known as "The Big Five"; they ended Amalgamated Press's near-monopoly of the British comic industry. Another success was the Fun Section of D. C. Thomson's Scottish weekly newspaper The Sunday Post, which included the two strips Oor Wullie and The Broons by lead artist Dudley Watkins, as well as other funnies and various puzzles and adventure stories. This gave R. D. Low, the head of children's publications at D. C. Thomson at the time, the idea to create another Big Five, this time of comics intended for both boys and girls and consisting mainly of 'funnies' and more lighthearted adventure and text stories. The first of these publications, The Dandy, commenced in 1937 and was followed by The Beano on 26 July 1938. A third paper, The Magic Comic, aimed at a slightly younger audience, followed in July 1939, but ceased publication in early 1941, due to paper rationing. Wartime shortages also prevented the New Big Five project from being completed. The Beano comic takes its name from the English word beano which can be loosely interpreted as a good time. The first edition of The Beano was dated 30 July 1938, and the 3000th issue was published in January 2000. There are only 12 known copies of the first issue in existence, and only 5 known copies of the second issue (not including facsimiles). The first issue's cover could be found on the back of issue 2000. A copy of this first issue sold for £12,100 on 16 March 2004, which was at the time thought to be the highest price ever paid for a British comic at an auction. The current highest price is £20,350, which was paid for the first issue of The Dandy on 7 September 2004. The Beano is now the longest-running weekly comic, since The Dandy became a fortnightly comic in 2007. The Beano is so popular that it had its own section of the Chessington World of Adventures theme park, "Beanoland". This opened in 2000 and survived for a decade before sponsorship was eventually lost. Most of the major Beanoland attractions remain in operation today but have been rethemed as "Wild Asia". On 19 March 2012 The Royal Mail launched a special stamp collection to celebrate Britain's rich comic book history. The collection featured The Beano, The Dandy, Eagle, The Topper, Roy of the Rovers, Bunty, Buster, Valiant, Twinkle and 2000 AD. The original editor was George Moonie, 1938–1959, followed by Harold Cramond, 1959-84. Euan Kerr was editor from 1984 until he handed over to Alan Digby in early 2006. Alan had been Beano Chief Sub Editor when Euan first became editor, and later edited The Beezer. Euan has returned to edit BeanoMAX as of issue 2 (see below). Following the retirement of Euan Kerr, Alan Digby is now Editor-in-Chief of both titles. Recently, (28 February 2011) there has been news that Digby has retired leaving Michael Stirling as the new editor of the Beano. Since 1982 the comic, along with The Dandy, has also run "Comic Library" titles. Released monthly, these titles are a feature length (usually about 64 page) adventure, featuring a character from the comic itself. They are available in A5 size only. In 1998, these were replaced by the Fun Size Beano. Fun Size Comics were discontinued in late 2010. The comic also ran A4-sized Beano Specials in 1987 with full coloured pages, which later were replaced by Beano Superstars which ran for 121 issues from 1992-2002. These were similar to the Comic Library series. Some of the last issues were printed versions of episodes from the 1996-1998 Dennis and Gnasher animated TV series. A Beano Poster Comic series was also printed in the early 1990s. The Beano Specials returned in 2003, and were now published seasonally. The issues were numbered, and the first one was a Dennis and Friends special, the last a Christmas reprint special. These were replaced by BeanoMAX in early 2007. On 15 February 2007, the first issue of a monthly comic entitled BeanoMAX was published. The sister comic features many of the same characters, however the stories in BeanoMAX are written in a longer format meant for 10-13 year olds. The first issue was a Comic Relief special featuring assorted celebrity guests. Plug was a comic based on the eponymous character from The Bash Street Kids that began with issue dated 24 September 1977, and is notable for being the first comic to make use of rotogravure printing. The magazine similar in style to I.P.C's Krazy which had started the previous year. It contained uncharacteristically outlandish material for D C. Thomson, as well as later including celebrity appearances in the comic. The comic revealed Plug's full name to be Percival Proudfoot Plugsley and also gave him a pet monkey by the name of Chumkee. Plug's strip was mostly drawn by Vic Neill but other artists, including Dave Gudgeon drew some later strips. Other strips included Antchester United, Violent Elizabeth, Eebagoom, Hugh's Zoo and D'ye Ken John Squeal and his Hopeless Hounds. The venture was unsuccessful, in part because the comic cost 9p, with the Beano at the time only costing 4p and most of its rivals priced similarly. It merged with The Beezer on 24 February 1979. The brand new Dennis and Gnasher was launched separately from The Beano in September 2009. Dennis and Gnasher got their own TV series on CBBC from 7 September 2009 to accompany the comic's new look. This was their second, having also had one in 1996, which ran for two series on CBBC, The Children's Channel, and Fox Kids. Dennis and Gnasher were presenting their own radio show on Fun Kids from 5 September 2009. The Beano's first major revamp was in the 50th birthday issue of 1988, when the page number was increased, the comic had a wider paper style, and more colour was used throughout. Another occurred in issue 2674, dated 16 October 1993, when the whole comic was now printed in full colour, along with some new strips such as The Numskulls, which had been moved from The Beezer. No major revamps happened from then until 1998, when Dennis' baby sister Bea was born. The logo was rounded and embossed (but later flattened in February 1999), and there were 8 extra pages. Computers were starting to be used for articles and speech bubbles, rather than the usual hand drawn ones. Since April 2007, The Beano has had five revamps to help it keep up to date. The first occurred on 7 April 2007. The logo was raised using a heavy black drop shadow, and the body of the lettering and its yellow trim were separated by a subtle 3D groove effect. The website address was looped inside the "O". This logo had been used in the Beano Club for one issue in 2006. Two new comic strips were introduced, these being The Riot Squad and Fred's Bed, reprints from Hoot and The Beezer and Topper respectively. There was a record number of uncredited reprints, with the likes of Ivy the Terrible, Calamity James, Les Pretend also being reprinted. In certain areas of the UK, such as Lancashire, the price was increased to 99p, while elsewhere it remained as 85p. The second happened on 27 October 2007. The logo was still grooved, but was now back to the rounded style which it had from 1999 to 2006. It was quite similar to the original rounded logo from 1998, which was flattened the following year. The number of reprint pages was cut from 4 to 2, but more started to appear after about a month. Two new strips were also added, Johnny Bean from Happy Bunny Green and London B412. The price increased to 99p across the whole UK. The third was the least major revamp. The background was changed from one colour behind the logo and another behind the Dennis strip to one single colour or a pattern, such as red and black stripes. New fonts were being used on the front cover, and the "Pocket money price" logo had been changed to a large "WOW! 99p" which was usually placed in the top corners. No new strips were added this time, but the amount of reprints went up to 5, sometimes lowering back to 4 per week, and an extra Dennis strip was added on the inside back two pages. The fourth revamp, which happened with the issue dated 18 October 2008 had been the most major revamp to date. There was a return of Billy the Cat inside, as well as a new Super School strip by Lew Stringer. The price rose to £1.25 per issue. Different characters appear on the 'O' each week in a cleaner tidier embossed logo. New headline fonts were introduced (CCZoinks), the balloon font was also changed to Cloudsplitter by Blambot. But the main change was the paper style, which had finally changed from newsprint to a gloss, much in the style of the inside pages of the then companion papers Dandy Xtreme and BeanoMAX. The only difference between these paper styles is the front cover, which was thicker on the Dandy Xtreme and BeanoMAX, but the same as the pages throughout in the weekly Beano. As of late 2010, The Beano is printed by BGP and the comic is now in an A4 format. A mild revision of style accompanies this with balloon font changed to CCTimeSaleLower, an upper and lower case font and a much larger Beano logo on the cover. The font CCZoinks appears to have less prominence with CreativeBlockBold taking centre stage. The Beano Club was closed down in 2010 and it's pages changed to Beano VIP with more online presence. The paper is still glossy, but the paper stock gives it a matte feel. At the start of 2011, the Beano VIP pages were dropped from the comic, but the online features remain. In the issue dated 12 October 2011, there was another revamp. The comic was expanded to 36 pages, and the paper stock was made smoother. The Number 13 and The Germs strips returned as reprints. A reader's page was also reintroduced, this time titled the Menace Gallery. After two appearances, this was renamed "The Treehouse". In the issue dated 28 January 2012, The Beano's cover changed. The logo was now more like the 1972-1998 version, but with the "The" inside the B, like it was mainly since then. The special "O"s that had appeared sometimes in the last year were also kept. The first panel of the Dennis & Gnasher strip also appeared on the cover, like from 1972-2008, but the "This Week In Beanotown" feature still appeared across the bottom. As a celebration, in partnership with the CLIC Sargent charity, 2 August 2008 was Gnashional Menace Day, where children were sponsored to behave like Dennis. The anniversary was also celebrated with a 40-page issue (instead of 32 pages; the 60th birthday issue also had extra pages, 48 instead of 24) guest edited by Wallace and Gromit creator Nick Park, price £1.50 (not 99p) and an issue of Classics from the Comics devoted to the Beano. There is also a special 64-page book available, The Beano Special Collectors Edition: 70 Years of Fun, giving a brief history of the comic. In the Beano's home city of Dundee, a special exhibition was held at the University of Dundee featuring original artwork and other memorabilia loaned from D.C. Thomson - it ran until 20 September 2008. In London the Cartoon Museum showed the exhibition Beano and Dandy Birthday Bash! from 30 July to 2 November 2008, featuring original artwork from all eight decades of both 'The Beano' and 'The Dandy', including work by Dudley D. Watkins, David Law, Leo Baxendale and Ken Reid as well as David Sutherland and many contemporary artists. There were events for children throughout August. There was also a special coffee table book called The History of The Beano: The Story So Far, published by Waverly Books. The Dandy is a long-running children's comic published in the United Kingdom by D. C. Thomson & Co. The first issue was printed in December 1937, making it the world's third-longest running comic, after Detective Comics (cover dated March 1937) and Il Giornalino (cover dated 1 October 1924). From August 2007 until October 2010, it was rebranded as Dandy Xtreme. The publishers have announced that the final printed edition will be issued on 4 December 2012, the comic's 75th anniversary, after sales slumped to 8,000 a week from a high of 2 million a week in the 1950s, but The Dandy will continue to be available online. The first issue, under the name The Dandy Comic, was published on 4 December 1937. The most notable difference between this and other comics of the day was the use of speech balloons instead of captions under the frame. It was published weekly until 6 September 1941, when wartime paper shortages forced it to change to fortnightly, alternating with The Beano. It returned to weekly publication on 30 July 1949. From 17 July 1950 the magazine changed its name toThe Dandy. In 1938, less than a year after the comic's debut, the first Dandy Annual was released. Originally called The Dandy Monster comic, this was an annual bumper edition of the comic and has been released annually since then. In 1954 the firstDesperate Dan Book was released, mostly consisting of reprints. Another was released in 1978, and it was released yearly between 1990 and 1992. Bananaman and Black Bob also had their own annuals. Although later issues were all comic strips, early issues had many text strips, with some illustrations. In 1940, this meant 12 pages of comic strips and 8 pages of text stories. Text stories at two pages each were "Jimmy's Pocket Grandpa", "British Boys and Girls Go West", "There's a Curse on the King" and "Swallowed by a Whale!" In 1963 the first Dandy summer special was published, a joint Dandy-Beano summer special; the first exclusively Dandy Summer Special was released the following year. In 1982 the Dandy comic libraries were released, which later became known as the Fun Size Dandy. These were small-format comics usually featuring one or two long stories starring characters from The Dandy and occasionally other DC Thomson comics. In September 1985, the ailing Nutty was merged with The Dandy, bringing with it the Bananaman strip, currently the third-longest-running strip still in the comic. Just over a year later, the short-lived Hoot was also merged with The Dandy, most notably incorporating the character Cuddles into the pre-existing comic strip Dimples to form Cuddles and Dimples, another of The Dandy's longest running comic strips. After issue 3282 (dated 16 October 2004) The Dandy underwent a radical format overhaul. The comic changed format and content, reflecting a more television-oriented style, now printed on glossy magazine paper instead of newsprint. The price was raised from 70p to £1.20 (99p for the first two weeks), a new comic strip called "Office Hours" (a comic strip about the adventures of the writers of The Dandy) appeared, and two supposedly new ones also started, though they were actually revivals from a few years earlier ("Jak" and "Dreadlock Holmes"). In August 2007 (issue 3426), The Dandy had another update, becoming the fortnightly comic-magazine hybrid Dandy Xtreme, priced at £2.50. Unlike previous incarnations, Dandy characters did not necessarily grace the cover every issue; instead, celebrities and other cartoon characters were featured; the first Dandy Xtreme had Bart Simpson on the cover. The Dandy Xtreme had a theme for each issue, usually a movie or TV show. From 27 October 2010 (issue 3508) The Dandy returned as a weekly comic and dropped "Xtreme" from its title. The contents received a major overhaul, and all the comic strips from the Xtreme era except for Desperate Dan, Bananaman andThe Bogies were dropped. Bananaman was also taken over by a new artist, Wayne Thompson, and Korky the Cat, who appeared in the comic's first issue in 1937, made a return drawn by Phil Corbett. 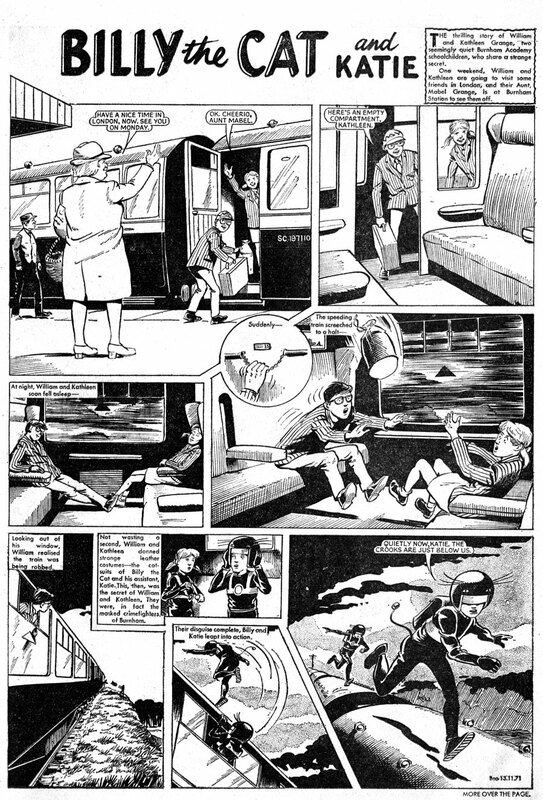 Korky's strip was changed from 1–2 pages to 3 panels, to make way for new comics. Many new celebrity spoofs such as Cheryl's Mole became a feature, but other new strips included Pre-Skool Prime Minister and George vs Dragon, drawn by Jamie Smart and Andy Fanton. The 76-page Christmas special featured a pantomime, a 12-page Harry Hill strip, free gifts, and the return of some characters. More recent new strips are "Punslinger", "Dad's Turn To Cook", "My Freaky Family", "Animals Eat The Funniest Things", "Star T.Rex" and "Brian Damage". Song parodies and fake recipes also appeared in The Dandy. 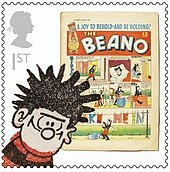 On 19 March 2012 the Royal Mail launched a special stamp collection to celebrate Britain's rich comic book history, which included The Dandy among many others. A follow-up to Waverly Book's The History of The Beano: The Story So Far, called The Art and History of The Dandy, was released in August 2012, the Dandy's 75th anniversary year. A Waverly book about The Dandy was originally to be released in 2007 for the comic's 70th birthday, but was cancelled with no explanation. The original editor was Albert Barnes, who according to The Legend of Desperate Dan (1997) was the model for Dan's famous chin. Barnes remained in the role until 1982, when he was succeeded by Dave Torrie. His replacement, Morris Heggie, left the editorship in 2006 to become the DC Thomson archivist. The current editor is Craig Graham. Over its almost 75-year run hundreds of different comic strips have appeared in The Dandy, many of them for a very long time. The longest-running strips are Desperate Dan and Korky the Cat, who both appeared in the first issue. Following mergers withNutty and Hoot, the Dandy inherited a number of their strips, most notably Bananaman from Nutty and Cuddles from Hoot, who teamed up with a Dandy character to form a new strip entitled Cuddles and Dimples. Both have been quite long-running, having been in the Dandy since the 1980s and each having appeared on the front cover of both The Dandy and the comics from which they originated. After the closure of The Beezer and The Topper, The Dandy inherited some of its strips as well, including Beryl the Peril, Puss 'n' Boots (who had been in Sparky before being moved to The Topper) and Owen Goal (who appeared in Nutty under a different title). The comic has had a number of different cover stars (comic strips appearing on the front cover), firstly Korky the Cat, who was on the cover from 1937–1984. Desperate Dan, long since the comic's most popular character, then took over the cover, a position he retained until 1999 when he was replaced as cover star by Cuddles and Dimples. However, they were not on the cover for very long and Desperate Dan had been restored to the cover by the end of 2000. The comic revealed that Cuddles and Dimples were thrown off the cover for "being too naughty", though in reality the comic's readers wanted Dan to return as the cover strip. In 2004, following a major revamp, Desperate Dan was replaced on the front cover by Jak, a character created for the cover, slightly based on an older strip with the same name, although other characters, including Dan, also made occasional cover appearances. The front cover also had a subtitle, for example, "Better than the Beano". During the Dandy Xtreme era the comic had no cover star, and covers were often given over to celebrities or current trends, but after the comic returned to its weekly, all-comic format in October 2010, the popular British comedian Harry Hill took over the cover spot. There are frequent fictional crossovers between Dandy characters, as most of the characters lived in the fictional Dandytown, just as the characters in The Beano were portrayed as living in Beanotown. Many of the comic strips in The Beano are drawn by the same artists, and crossovers between the two comics occur occasionally. Quite often, one comic will make a tongue-in-cheek jibe at the other (e.g. a character meeting an elderly lady, and stating that she's "older than the jokes in The Beano"). In the strips, it is expressed that Dandytown and Beanotown are rivals, The Dandy did a drastic format change Dandytown had an embassy in Beanotown, which many of the town's citizens unsuccessfully attempted to overrun – the embassy was never referred to in The Beano. This rivalry inspired the spin-off computer game Beanotown Racing, in which various characters from both comics could be raced around points in Beanotown, including the embassy. The game was given a a great deal of advance publicity in the comics, with story lines often revolving around how each of the characters acquired his or her vehicle.